Sometime in the late 1960s, I was working, unhappily, for Local 1199 of the Drug and Hospital Workers Union here in New York City. There were dozens of reasons why I was miserable with the job; the main ones being that I wasn’t particularly good at it and that I really wanted to write. But whenever I asked the union leadership if I could transfer to their news magazine, the answer was always, “Organizers organize and writers write.” In other words: No. I finally left 1199 to take a job as the editor of another union’s newspaper, a post from which I was fired after producing a “1968 Election Special” without ever once mentioning the name of Hubert Horatio Humphrey. So there I was: 23 and unemployed. I had a pal from 1199, a writer/photographer named Joe Walker, who’d left the union to become the editor of Muhammed Speaks, the newspaper of the Nation of Islam. One day he phoned to say that he’d just done a story for The East Village Other and that they were looking for writers and that I ought go down there and talk to them. 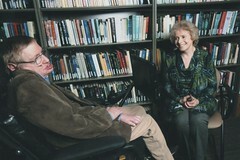 Arizona State UniversityClaudia Dreifus with Stephen Hawking. So I went to the EVO’s Second Avenue office, directly above Ratner’s Restaurant and the Fillmore East, and met with Allen Katzman and Dean Latimer and, if memory serves, Joel Fabrikant. All I had in hand were some clips from the Nation, from union newspapers and from the Chelsea Clinton News, where I’d been the restaurant reviewer. It was enough. I was in, with a packet of assignments on migrant farm workers, the legal case involving the draft and a free clinic on the Lower East Side. The EVO that I joined in 1969 was an interesting mix of counterculture cultures. There were the aging Beats who’d founded the paper, represented by Allen Katzman and Jaakov Kohn. It won’t shock that their main interests appeared to be poetry and drugs. The cartoonists and artists were a cohort of their own, vibrant, crazy and fun; even then, you knew that every one of them was a genius — R. Crumb, Artie Spiegelman, Yossarian, Spain Rordriguez, Kim Deitch, Trina Robbins; “little” Stevie Heller fresh from high school radical politics. 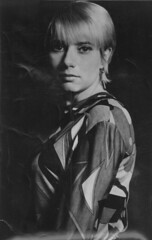 There was also an odd mix of critics and columnists, who fell into absolutely no category anywhere, like Lita Eliscu, an underground Liz Smith, who knew everyone south of 14th Street and Alex Gross, who was on the ground, with every moment of the revolutionary art scene. Yet in a different corner were a cluster of characters who were really more journalists than anything else — Dean Latimer, Ray Schultz, myself and later, Lynda Crawford. If Allen Katzman and Jaakov Kohn worshipped Timothy Leary and Baba Ram Dass, our gods were Murray Kempton and Jimmy Breslin. In many ways, the reporters — certainly this one — were the straights at the party. I sometimes felt a little like Margaret Dumont amidst the Marx Brothers, though — as she — I was having a ball. The arrival in New York of Bernadette Devlin, a then 22-year-old Northern Ireland civil rights leader who’d just been elected to the British parliament. She borrowed my dress to have something to wear for her address to the U.S. Congress. The first march of the second wave of feminism in August of 1970. Sometimes now, I look at the newsreel footage of that brave moment and there I am with my blonde Louise Brooks haircut, right in the second row—taking notes and marching. The time that Ray Schultz went to East Harlem to cover the Young Lords and ended up locked up in a church they’d seized. We didn’t see him for two weeks. Going to a peace demonstration with our bold and brave shutterbug, Raeanne Rubinstein, where some bully mainstream media photographer tried to push her out of her shot. Boy, was he sorry! Receiving a packet of free press tickets to the Woodstock Festival of Music and Art. “Who the hell would want to go to that?” Latimer declared. We handed out our tickets to strangers on St. Marks Place and then headed to Fire Island. We won’t talk here about how the party ended. Even now, what I remember most was that for a brief moment in the late 1960s, EVO was the place to be.